For the utmost in accuracy, the bolt face should be perpendicular (square) to the centerline of the bore and chamber. On production rifles, no special attention is normally given to the squareness of the bolt face as it relates to the chamber, which provides the gunsmith with another opportunity to improve the accuracy of a factory rifle. To use this tool, simply screw it into the receiver threads, apply polishing compound to the face of the mandrel and use a 3/8" electric drill to turn the mandrel and polish the bolt face square to the centerline of the bore. 3/8" hand-drill is then used to rotate the center shaft of tool against the bolt face (once 600 grit polish has been applied) to smooth and polish the boltface for better case head support and more positive headspacing. Lapping tools are slightly smaller than nominal bolt face diameter. 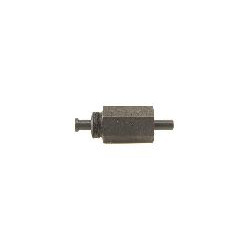 Standard lap diameter fits .243, .308, .30-06 case head diameter cartridges. Magnum lap diameter is for .550 bolt face. Lap center shaft length 4"